The thing about writing for magazines is that you are often beholden to advertisers (not biting the hand that feeds you and what not); While Bell & Ross have developed rather beautiful case and dial designs, I find their price tags a tad un-acceptable for luxury timepieces with stock ETA movements. Unveiled at Baselworld and building upon the innovation first developed in Timex’s engineering facility in Pforzheim Germany, this Intelligent Quartz T Flyback Chronograph carries all of the Bell & Ross look and swagger sans price tag and sadly, automatic movement. The Intelligent Quartz system is dubbed thusly because of its ability to accommodate up to three additional independent hands. The dial aesthetic of this Timex Chronograph (especially in the sand version) is so well laid out that the Bell & Ross comparison is inevitable. The IQ fly-back chronograph comes equipped with the standard INDIGLO night-light of regular Timex watches and one ups it with a second time zone and date feature. Water resistant up to 100m, the Flyback chronograph is part of the top of the line Sports Luxury Series. 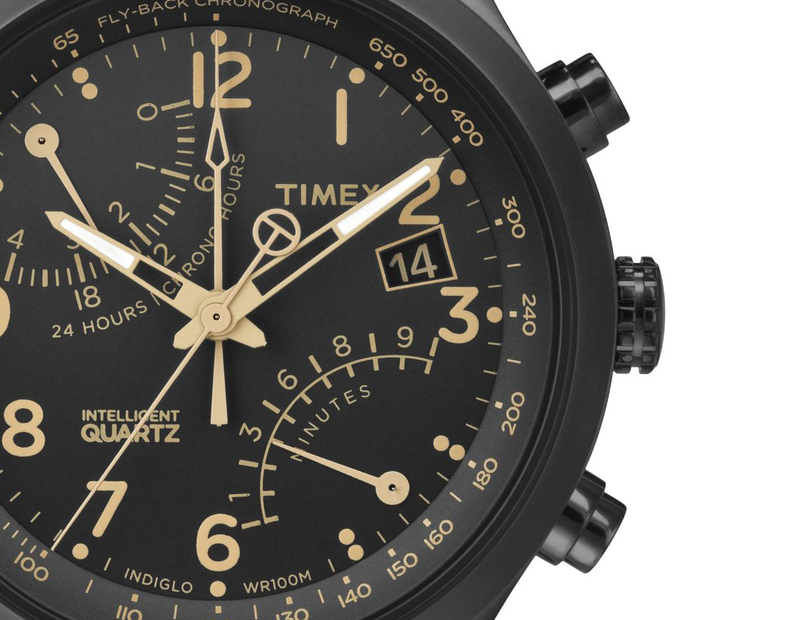 Sports-inspired yet luxurious in a way that betrays its $165 price tag, the Timex Intelligent Quartz T Flyback Chronograph gets this Monsieur’s unequivocal vote for men looking to an affordable everyday watch. I am really glad I got this watch, I have not worn one for a very long time beucase I started using my mobile, instead of a watch for the time! . My first Impressions were that the watch looks a lot different compared to my old one’s and better!. Firstly the whole face of the watch looks really smart,(It’s a black/grey colour), it goes well with the brushed finish of the frame(if that’s watch its called?) The black screws really set it off, along with with black strap. Having the rubber strap feels much more comfortable compared to the stainless ones and saves a lot of weight, which is a plus beucase one of the reasons I stopped wearing one was beucase it was quite heavy and I always knew it was on my wrist, slowing me down at work!!! But with this watch I can forget I’m wearing it beucase of it’s lightness. (It still has that quality feel to it, and doesn’t look or feel cheap at all) The buttons and the crown all work fine and are easy to use/set up once you have read the instruction booklet. Also the buttons are no harder to press than any other watch, it will click once,,then you press the other button and when that clicks it resets the button you first pressed. (I don’t think someone had a faulty one, but its possible, anything is).Also .I don’t think the glass is more reflective than any other watch glass,,it has a slight convex, which will make it seem more reflective.I bought this for my dad but liked it so much I kept it..(sorry pa! I’ll get you something else)!! !